Where the states of Indiana, Illinois, and Kentucky meet, so do the Wabash and Ohio rivers. At this junction, the Ohio picks up water from the Wabash and continues flowing generally southwest until it joins the Mississippi River near Cairo, Illinois. Here, the Ohio River adds a tremendous amount of water to the Mississippi River, making the Ohio River a major source of freshwater that ultimately reaches the Gulf of Mexico. The connections in this drainage system, or watershed, is why the heavy rains that spurred flooding in the Midwestern United States in late February 2018 ultimately led to flooding in Louisiana in early March. What happens downriver is largely affected by what happens upriver. The pulse of floodwater on the Ohio helped deliver freshwater and a sediment plume to the Gulf of Mexico. 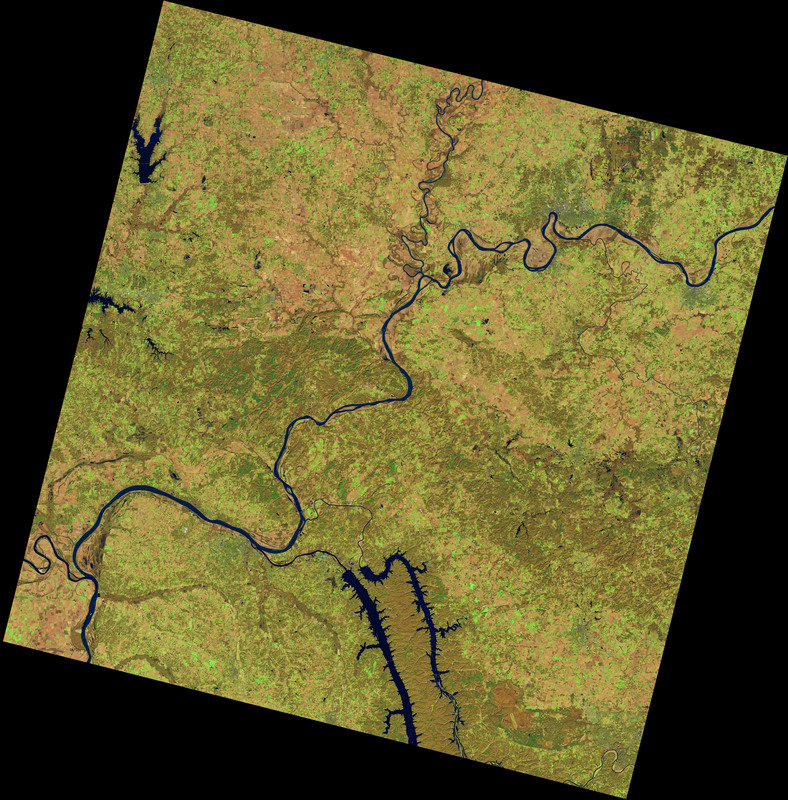 The recent flooding at the confluence of the Wabash and Ohio rivers is visible in this image, acquired by the Operational Land Imager (OLI) on the Landsat 8 satellite. 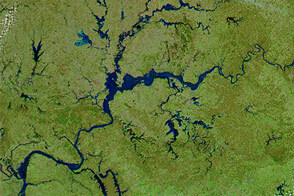 The image is a composite, showing floodwater on March 3, 2018, combined with an image acquired on November 7, 2017, that shows the typical widths of the rivers. 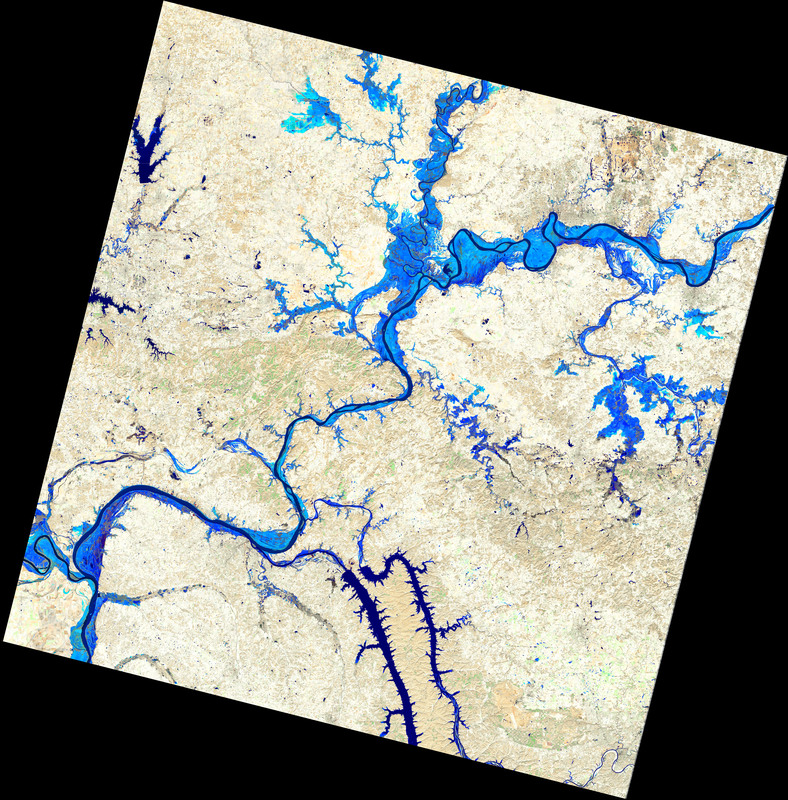 It is false-color (bands 6-5-3) to better distinguish flooded areas (blue) from the surrounding land (tan). 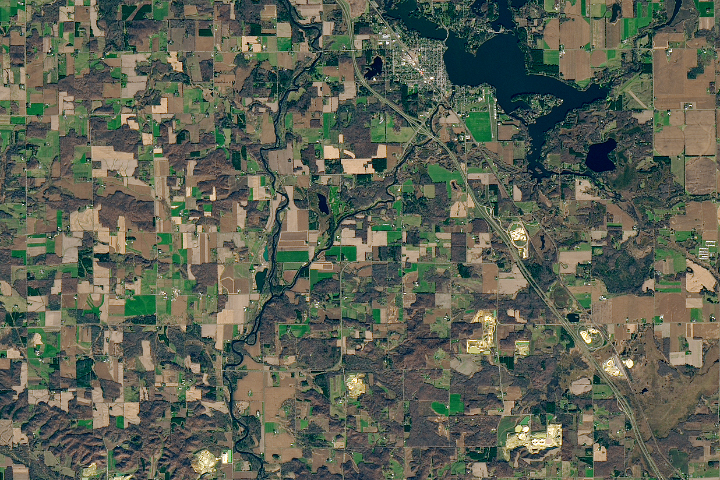 John Sloan, a watershed scientist at the National Great Rivers Research and Education Center, pointed out that smaller tributaries on the west side of the image have narrower floodplains that become successively larger as the watershed becomes larger. 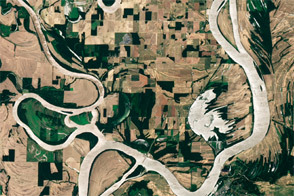 Major rivers, such as the Ohio, have very wide floodplains. This image shows the widespread flooding that can occur in the area around the confluence of major rivers like the Wabash and Ohio rivers. Floods can speed up the processes of erosion and sedimentation, increasing the volume and speed of the water flowing through an existing channel. During a flood, water and sediment can spill over a river’s natural banks and flow into the adjacent floodplain. In the image above, the blue area shows both the river channel and the portion of the floodplain that was flooded in early March. As the floodwaters slow and recede, they usually leave most of their sediments behind on the floodplain. Sometimes these add organic matter and fertility to the floodplain. In other cases, land is scoured and thick sand deposits are left behind-for instance, when a levee breaks and water rushes across the floodplain. Major flooding most often occurs when heavy, persistent winter rains coincide with snowmelt because the still-frozen ground makes water run off the landscape rather than soaking into the soil. The flood this winter along the Ohio River was the worst in two decades, according to news reports, but not the worst on record. “The winter flood of 1937 on the Ohio River was one of the worst to hit the Ohio River Valley, and the Wabash basin was a big contributor,” Morton said. 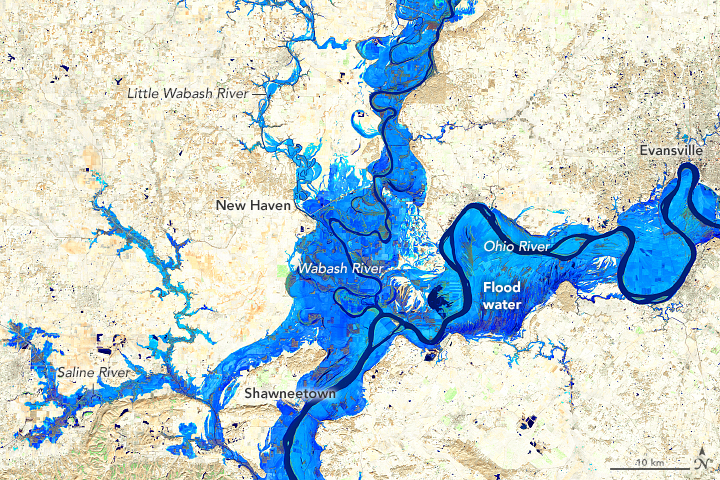 Waters rose to “major” flood stage north of the Ohio-Wabash confluence and inundated Evansville, Indiana. They crested well above major flood stage south of the confluence in Shawneetown, Illinois, and destroyed most of the town. 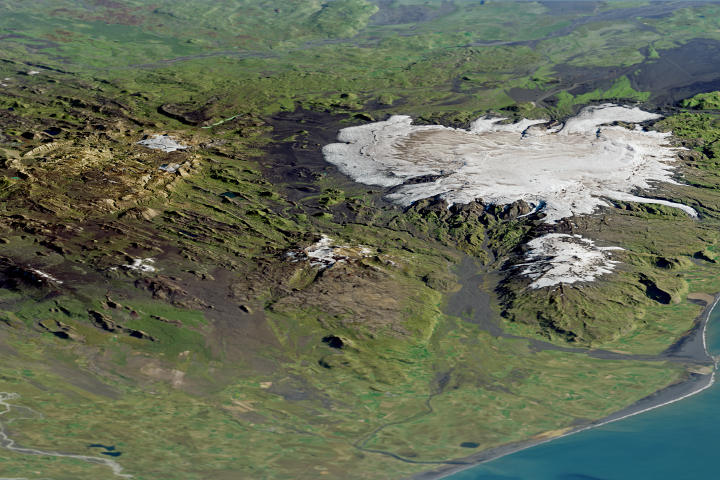 NASA Earth Observatory image by Joshua Stevens, using Landsat data from the U.S. Geological Survey. Story by Kathryn Hansen, with image interpretation by John Sloan/National Great Rivers Research and Education Center, and Kenneth Olson and Lois Morton/Iowa State University. What happens downriver can be largely affected by what happens upriver in the floodplains of major rivers. 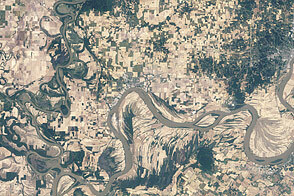 NASA Earth Observatory (2018, March 10) Sediment Plume off the Louisiana Coast. NASA Earth Observatory (2018, February 28) Flooding in the Central and Southern U.S..